Is Mercedes Cooking Up An Electric Mini G Wagon? Our spies capture the so-called Mercedes EQB. 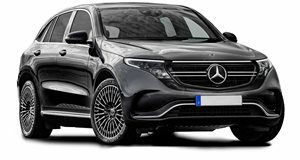 We’ve already seen prototypes of the new Mercedes-Benz GLB compact crossover nicknamed the "baby G Wagon” that will rival compact SUVs such as the BMW X1, Audi Q3, and Lexus NX. This model, however, is different. According to our spies, this is our first look at an all-electric GLB that could eventually be sold as the EQB positioned below the larger EQC electric SUV. Two different prototypes were spotted being tested in the snow to see how the components cope in cold-weather conditions. One of them was being tested alongside its larger EQC sibling. How do we know we’re looking at a fully electric Mercedes GLB rather than a hybrid? Well, the "Electric” sticker stamped at the top of the windshield is a bit of a giveaway, since Mercedes only puts this on fully electric prototypes. A recent report claimed the electric Mercedes EQB will have a range of up to 310 miles and feature an aerodynamically optimized GLB-based body according to factory insiders. This perhaps explains why the prototype is still fully camouflaged compared to the combustion-powered version that has already been seen with less camouflage. Alongside the combustion-powered versions and the fully electric model, Mercedes also plans to introduce a plug-in petrol-electric hybrid GLB with a claimed electric range of 62 miles. It will be powered by a 2.0-liter, four-cylinder gasoline engine and a gearbox-mounted electric motor to power the front wheels along with a second electric motor mounted within a ZF-produced rear axle assembly to power the rear wheels. These electric motors will be powered by a lithium-ion battery packaged within the floor of the new compact SUV. Mercedes-Benz EQ Silver Arrow First Drive Review: Hey Mercedes, Take Me To Mars! Thomas Geiger gives his impressions from behind the wheel of the futuristic Mercedes EQ Silver Arrow.